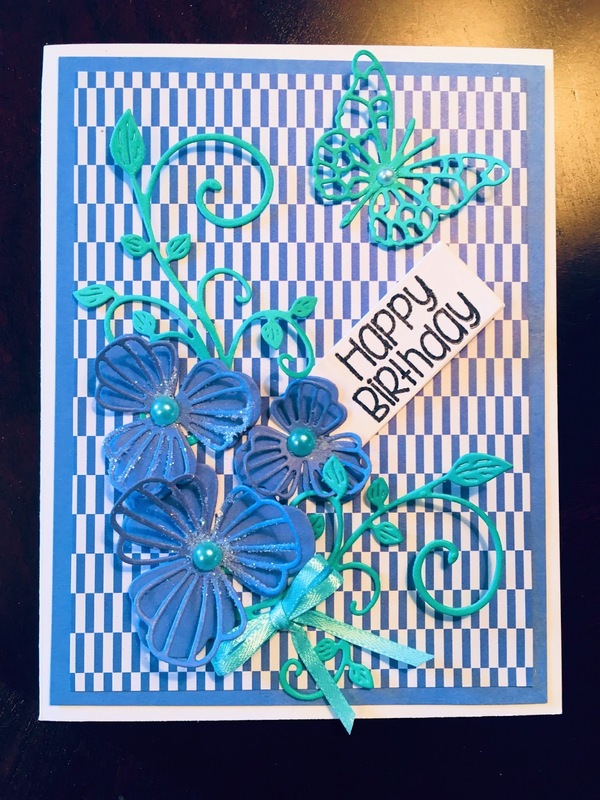 I wanted to make a simple card today that was bright and cheery; since most of the demand for my cards is for birthdays, that was a good choice for today. The background is run through a Cuttlebug EF called Birds and Swirls. I typed out the sentiment on my computer in a whimsical font and printed it out, then punched it out with a 1 1/2" scalloped punch; a 2" punch made the red background. A red half pearl accentuates the sentiment. The birds are from an unnamed brand, which I probably got from Wish.com. It is hard to see in the picture, but the birds do have quite a lot of detail. 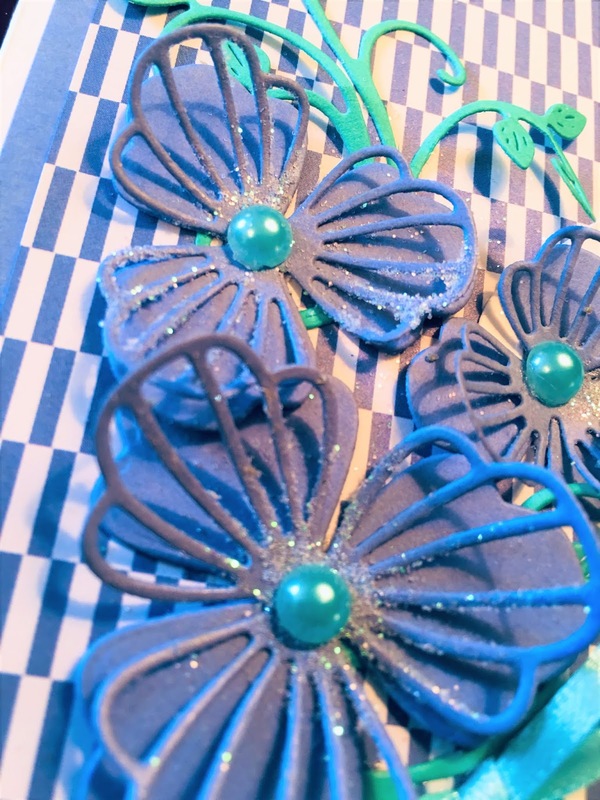 The eyes are made with black liquid pearls; a handmade double-looped bow finishes the card. A simple prayer for salvation: O, God! I know that I am a sinner! I thank You that Jesus Christ, Your holy Son, was born of a virgin, came and lived a sinless life here on earth, and died on the cross as a sinless sacrifice for my sin. He is no longer dead, but rose from the dead and is seated at the right hand of God the Father Almighty. I accept His atonement for every sin I have ever committed, and receive Your salvation. I put all of my trust in Jesus Christ of Nazareth and receive Him as Lord of my life from this moment on. Thank You, Father God, for this grace given to me! Today I fished around in my die bags: drew a die from the floral bag, a die from the foliage bag and a die from the butterfly bag. The flowers are Sue Wilson Striped Nasturtium, leaves are Cheery Lynn Fanciful Flourish and the butterfly is from Memory Box - Pippi Butterfly. I made a tag with the sentiment "Happy Birthday," and finished the card by putting turquoise half pearls in the center of the flowers, a white half pearl on the butterfly and a handmade double-looped turquoise bow. Well, Fellow Crafters, it has been a long time since my last post. I'll just say that life happens, and sometimes we are drawn away from our crafting creativity to things that are more on the front burner. GOD IS GOOD!!! 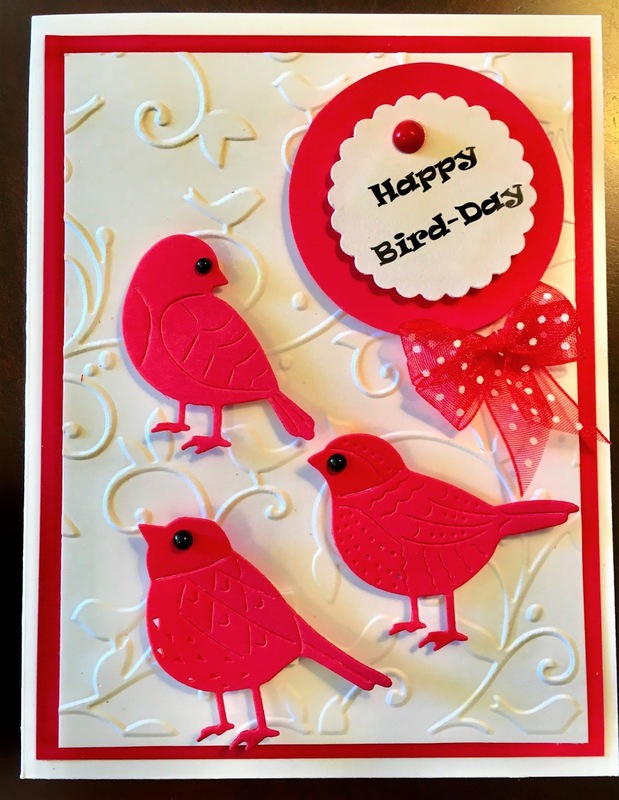 The last couple of days I have been making cards once again in my craft room. So, today's card is a very simple one that will fit into a regular A2 envelope; the background paper is black with bright pinks and yellows and greens, so I wanted to draw the eye away from the "darkness" of the image to capitalize on the brighter colors. The flowers are from a discontinued SU die; don't know the name of it. 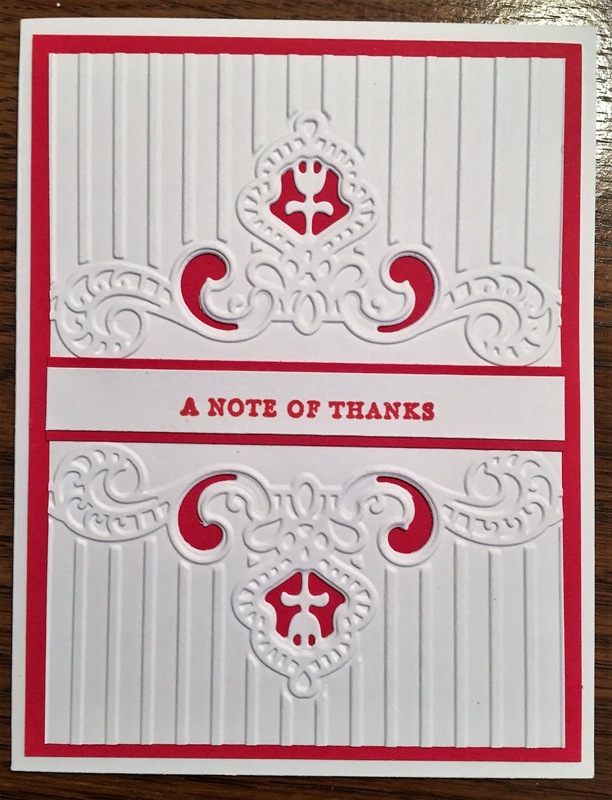 The sentiment is also a retired SU stamp, and is cut out with a Spellbinders Classic Circle die. I rubbed a bit of pink ink around the edges to give it some interest and to pick up the pink in the background flowers. The die-cut flowers and the sentiment are accented with pink half pearls, and a plain ribbon finishes the card. Just bumping around in my craft room today and came up with this card; I haven't used a purple/orchid/lavender palette in a long time, but decided to try putting something together with these colors. The Stampin' Up stamp I used was given to me a year ago by a fellow crafting friend. I have a special friend whose birthday is coming up; I hope that it gets to her in time, but because of Labor Day holiday, it may arrive late. Did you know that Spellbinders has a new product? They are embossing folders that also cut; how exciting is that????? These products are pricey for just a regular EF, but since they cut out as well, maybe the cost is okay. They are $9.99 at the Spellbinders site, plus shipping. If you have Amazon Prime, you can get them there for $9.99, but with free shipping. Love how this makes the paper look, and will be using these a lot in the future. You may remember me mentioning my Allstar Cardmaking Friend Jill, who makes 300 cards a month for charities. Well, she's at it again, and invited me to join her in making some thank you cards for nurses at a local children's hospital. You can check out Jill's wonderful blog here. She posts really helpful hints in addition to cards she has made and cards that others have sent her for charities that she ships cards to. Check it out and see for yourself! I don't know anyone like my wonderful friend, Jill!